Great Grandmaster Ming Lum was born in Chung San, Canton, China but grew up in Honolulu, Hawaii. He's known as Gung Fu's Godfather to two generations. Grandmaster Ming Lum started his martial arts training while in grade school at the Chungsan Language School in Honolulu where he trained Fat Gar (Buddha Family) with Grandmaster Lam Dai Young, one of three of the best at that time. He also trained Jujitsu with Grandmaster Henry Okazaki and Judo with Kenny Kawatachi during 1940-1941 just before WWII broke out. In 1955 he moved to San Francisco, California. In 1957, Grandmaster Lum began to study with Choy Li Fat Grandmaster Lau Bun. In the 1960's he was the first to introduce the Shaw Bros. Gung Fu Film's in San Francisco area. He was first to bring Chinese stylist to enter karate tournaments and has opened the doors for a non-Chinese to learn Gung Fu in San Francisco. Grandmaster Ming Lum has numerous of recognition awards and has also been inducted in the 1992 AMAPA Hall of Fame. 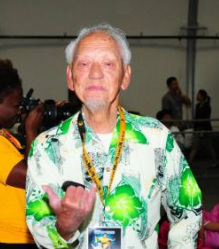 He has also been inducted into the Hawaii Kenpo Jujitsu Society Hall of Fame in 1999. He is truly a man of his words and deeds. Highly respected around the world among laypersons and martial artists alike. In addition to his many duties, community responsibilities he also serves as one of the first senior advisors of the Hawaii Kenpo Jujitsu Society since it's founding in 1995. Great Grandmaster Ming Lum has been council, advisor and public relations extraordinaire to virtually every martial arts promoter and tournament promoter in California. His renown is as such that he forms the cultural goodwill bridge between Asia and the United States. Primarily because he is knowledgeable of virtually every style of martial art taught in China and his acquaintance with all of the Great Grandmasters of both continents. Great Grandmaster Ming Lum has been responsible for hundreds, if not thousands, of success stories in the martial arts. Working closely with the San Francisco Chinatown community and the City of San Francisco to bring each closer to the needs and understandings of these contrasting cultures. We will miss you Grandmaster Ming Lum. Professor Louise “Imi” Okazaki-Mullins, youngest daughter of Professor Henry S. Okazaki, founder Kodenkan Jujitsu, began training at home with her two sisters, Betty Woman’slf and Myrtle Oberman. Their father taught them Jujitsu techniques and under his direction, they established a foundation of massage (heads, hands and feet) through many hours of practice with him as the patient. He entered his three daughters in a woman’s Jujitsu class instructed by Iwalani Tanaka and Jackie Wong. In the early sixties, the sisters were trained by Keiko Fukuda, the highest ranked female judoka in the Kodokan. Professor Mullins taught both Kodenkan and Kodokan techniques. She will leave a very large hole in the heart of martial arts and we will truly miss her. January 5, 2008 was a sad day for us still here on earth and a glorious day for those in heaven. was great friend and ally to the Martial Arts Collective Society.